This web site on Jennie (née Schwert) Freund is under development. We welcome your input, stories, photographs, documents, and other resources. Jennie Schwert was born in Buffalo, New York on October 29, 1891. She was the daughter of Johann (= "John") and Augusta (née Lorenz) Schwertfeger/Schwert. Jennie was baptized as "Johana Juliana Schwert" on November 1, 1891, by Fr. Ferdinand Kolb, Saint Boniface R.C. Church, 124 Locust Street, Buffalo. Michael and Juliana Riegel were godparents. Despite her baptismal name as "Johana," she was known as "Jennie" or "Jenne." Jennie wed Clifford Charles Freund, son of Albert and Louisa Freund. 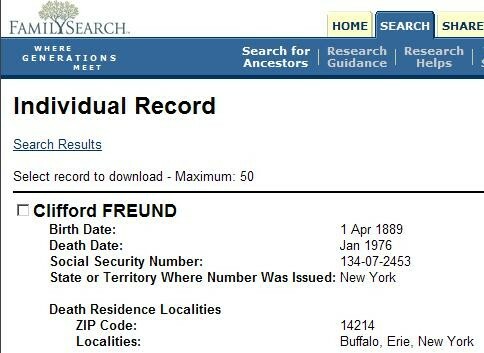 Clifford was born in Buffalo on April 1, 1889. Clifford was employed as a floorman for the Marine Trust Company. The 1930 U.S. Census shows that the couple resided at 168 Cayuga Street. They had at least one child, Genevieve born ~1913. Jennie died on November 5, 1950. Clifford died on January 14, 1976. We seek knowledge about Jennie, and about Clifford's and Jennie's places of interment. John (Johann) Schwertfeger / Schwert: Born 1858; died 1938. Augusta (née Lorenz) Schwertfeger / Schwert: Born 1858; died 1912. Genevieve Freund: Born ~1913; Living? Baptismal Record: Johana Juliana Schwert, born on October 29, 1891, baptized on November 1, 1891, Saint Boniface R.C. Church, Buffalo, NY. 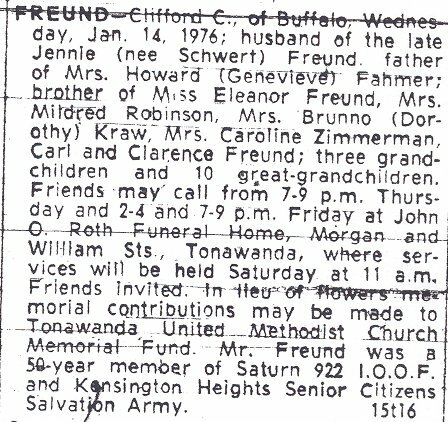 Obituary: Clifford C. Freund, died January 14, 1976. Social Security Death Index: Clifford Freund, born April 1, 1889, died January, 1976.